I haven’t been around these parts lately partly because I thought that what was really needed was for me to stop rambling about my knitting but just get on with it and finish all these unfinished projects I have on the go: Less blogging, more knitting kind of motto. The antlers were giving me trouble. I wasn’t happy with the knitted version so I ended up needle-felting them, which looks much better, to my opinion, and was great fun to do. Then onto the next challenge: even with wires in them, my antlers were not sticking up straight. They were all floppy like cocker spaniel ears. As you can imagine, that wasn’t the look I was after. The procrastination process was in fact very useful. As I spent weeks and weeks procrastinating – knitting away on other projects – I thought and pondered about these troublesome antlers. The more I thought the more I came up with ideas and I ended up putting a stick in each antler and I gaffer-taped the stick onto the back support. That on its own wasn’t enough, as the gaffer tape kept coming undone. 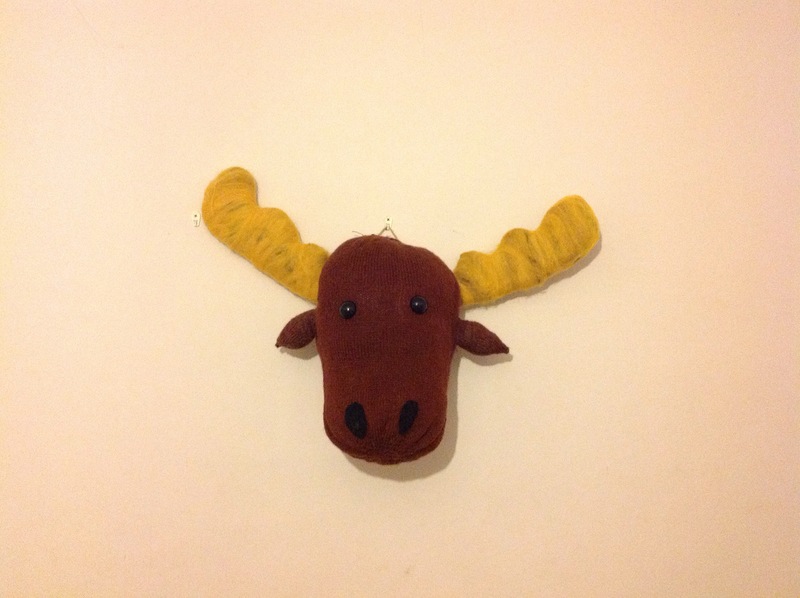 I had to sew the antlers with strong cotton thread too as a back up. It worked. And I also finished this guy…. 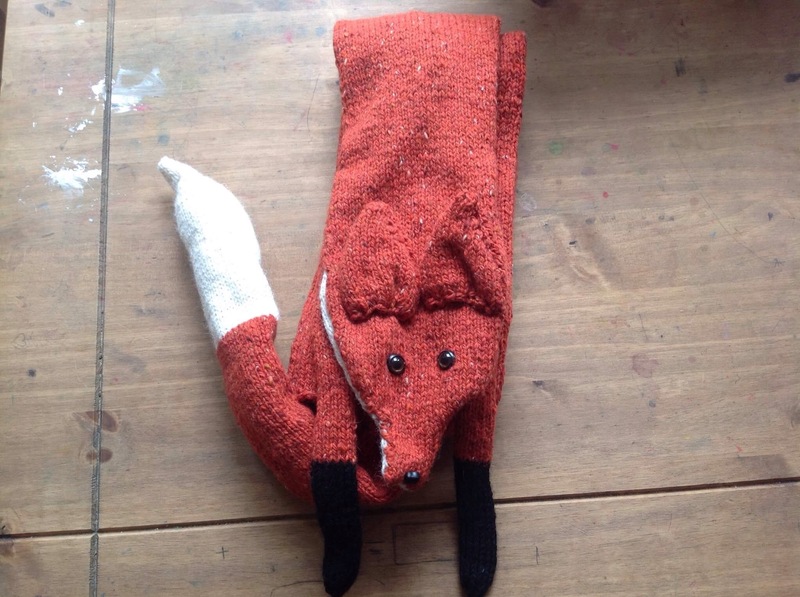 It’s a fox stole I had been working on for a little while… But I kept running out of yarn. I love this yarn, it’s from Donegal in Ireland. It’s gorgeous. You can’t quite see it on this picture, but it’s speckled with so many colours that I couldn’t stop knitting it up as I wanted to see what bright speckle was going to appear next! I have ordered more of it to knit a fox hoodie for a friend’s baby and a fox head to keep company to the moose head in my living room. 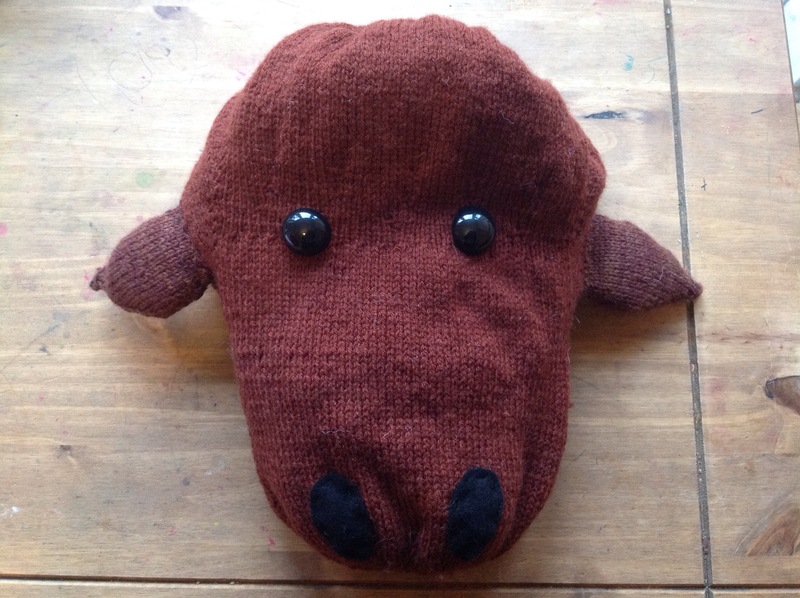 The two patterns – the moose head and the fox stole – are from Louise Walker. This is such an enjoyable project to knit! Very straight forward and drama free, once you know your Make 1 Right from your Make 1 Left, as there are quite a few of these. Otherwise it’s a pure relaxing, meditative knit. I’m knitting simultaneously the pocket pleats and the sleeves, as I don’t want to knit those last. 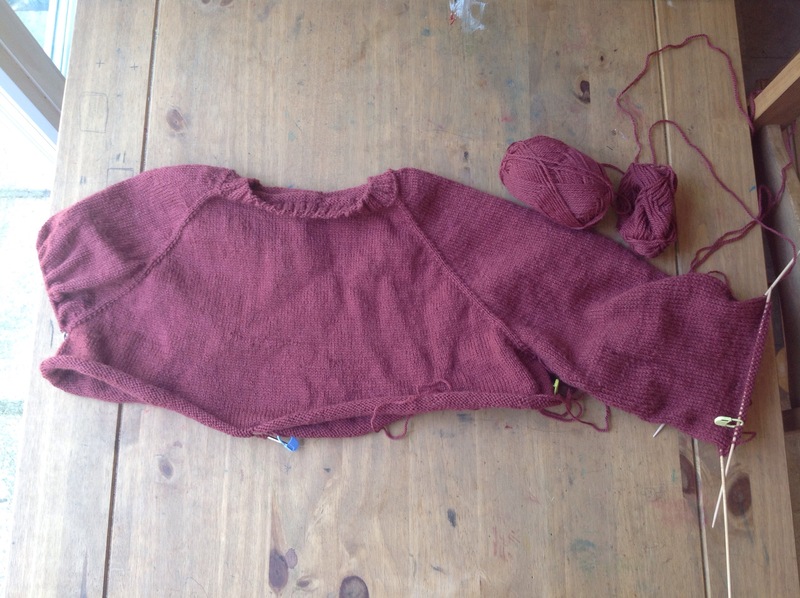 When the body is finished, I want to be able to wear the tunic straight away – Well… Weather permitting as it’s quite hot here already. I suppose wool has temperature regulating qualities, so it will be a great way to put this to the test this summer! I love your knitting, very nice, a lot of work. are you still talking to the dogs? I have learned how to commuinate with our dog.She is a spaniel cross collie.I know when she is listening to me, she moves her eyes side to side.She has trouble speaking to me though.I have to suggest things to her to make her understand, it is difficult.Any suggestions? Good to see you back! Taking a break from a project is always an effective way to problem-solve. Somehow removing it from focus conjures up the solution. The deer head is great fun but I especially like the fox stole. I can see all the variations in colour in the wool as you mentioned which makes it extra foxy. Yaaaay, welcome back! And it’s great to get a look at all your lovely finished projects… The moose head is awesome, and definitely worth all the procrastination 😀 Plus it’s nice to see Donegal yarn popping up on your side of the Irish Sea too. Good luck with the last part of your tunic! I love Donegal yarn!!! It’s so beautiful :) have you used it often? Not yet… Like all knitters, I have a hefty stash of yarn to work through before I can let myself get any more! I do love the colours though – they have some great shades, and the multicoloured flecks are an added bonus! Your mum must pick you up some great bargains! I’ve managed to limit myself to only buying yarn when I travel… But that means I come home with a suitcase full of wool! Yes she does but I have a lot of different yarn in different quantities, which are discontinued. And I just have them, but don’t have a particular project in mind for them… The moose head was done with yarn from that stash of old yarn she gave me, but for the fox stole it wouldn’t have worked… :) but having said that she also got me large quantities of the same yarn, I just didn’t come across anything that I could use them with… So much knitting and so little time!!! Tell me about it! When I get time to knit for myself these days, it feels like a real treat! As for your random yarn quantities, I think you used to be able to both buy and sell yarn on Ravelry. It’s a long shot, but someone might have just enough of what you need to finish a project! I’m very good at self-induced guilt.